Jump in the name of charity for your chance to win a trip to New York or Paris! 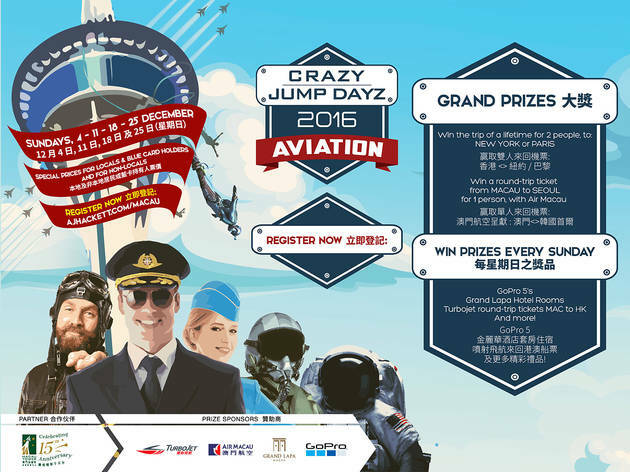 The world's highest bungee just got crazier with the annual AJ Hackett Macau Tower's yearly Crazy Jump Dayz 2016! 40 people will have the chance to leap off the spectacular waterside tower, but with a twist – you'll have to do it in costume! This year's theme is aviation so get ready to dust off your leather jacket and make sure those sunglasses are securely attached, because the best flyer will have the chance to win a grand prize of a two-night stay for two people at a luxury hotel in either Paris or New York. That's something worth jumping for! Other prizes include a round-trip for one to Seoul flying Air Macau. Prizes will also be given out to the best jumpers on each of the four days of the contest, with cool rewards like GoPro 5s and hotel stays in Macau also up for grabs. This year, the competition is taking place on very Sunday in December, so you have even more chances to win. You'll be leaping for a good cause, too, with four local charities benefitting from your bungee. It's first come, first serve, so make sure you plan ahead! 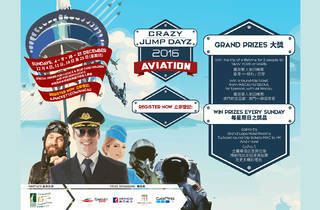 For more information, head to ajhackett.com/macau/crazy-jump-day-2016.